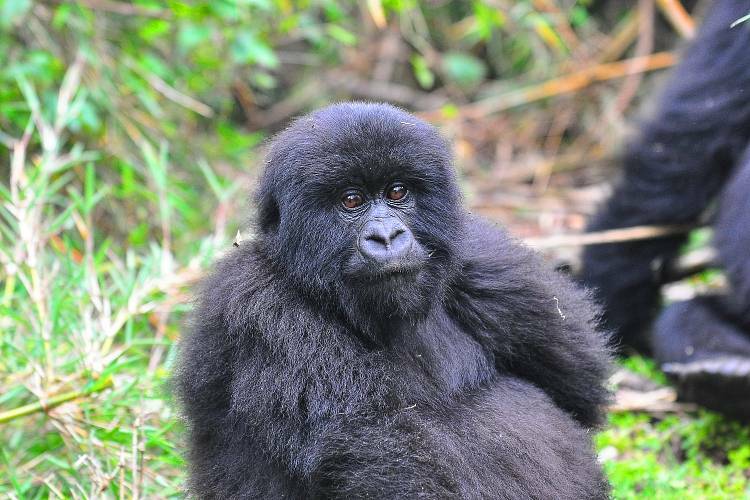 In 1977, poachers killed a gorilla named Digit, with which Fossey had established a special bond and trust over more than 10 years. 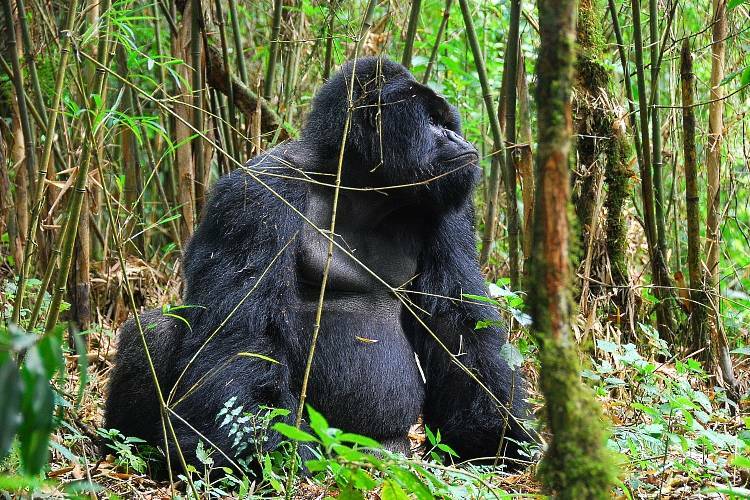 Digit was a silverback that died protecting a pregnant female, which managed to escape. 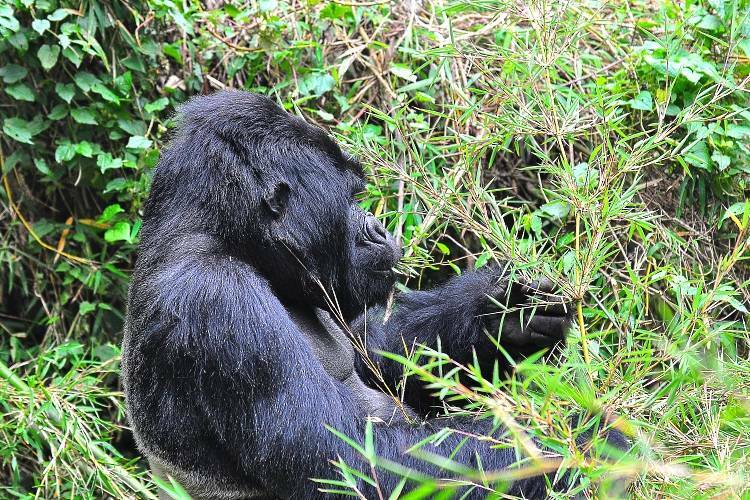 Digit was stabbed repeatedly and his head and hands were removed. 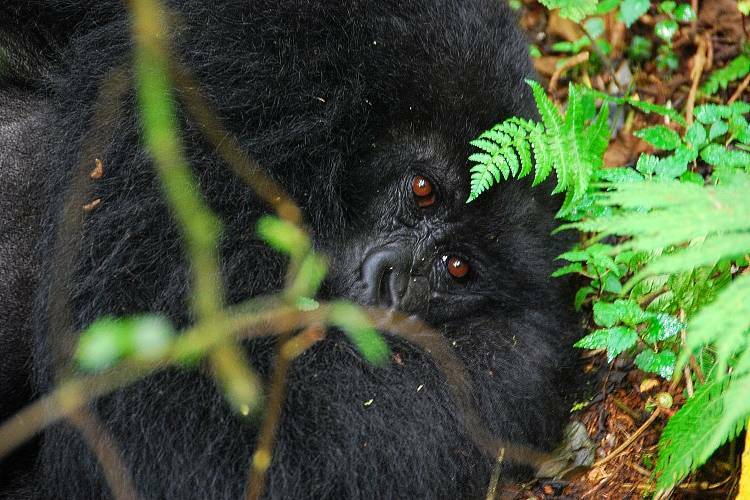 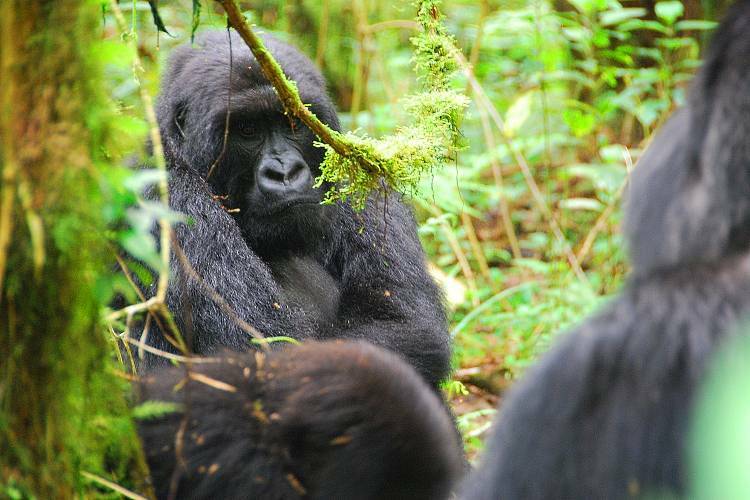 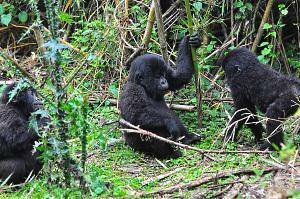 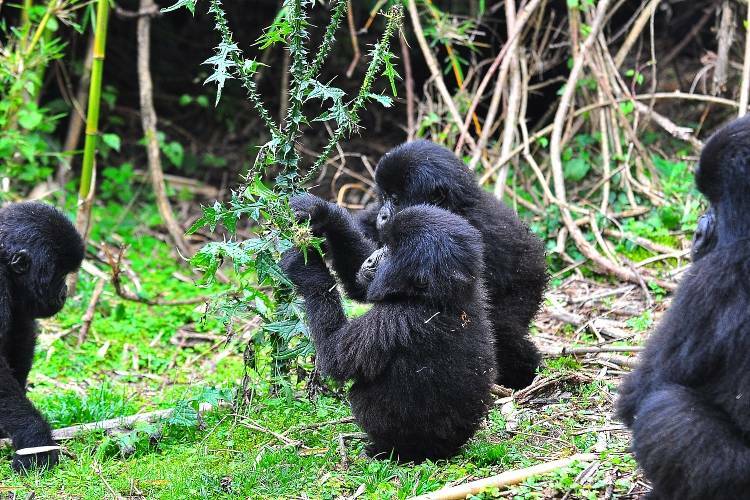 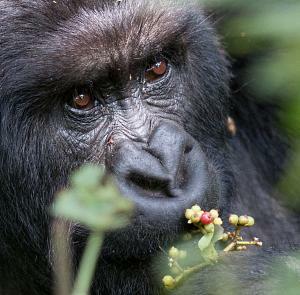 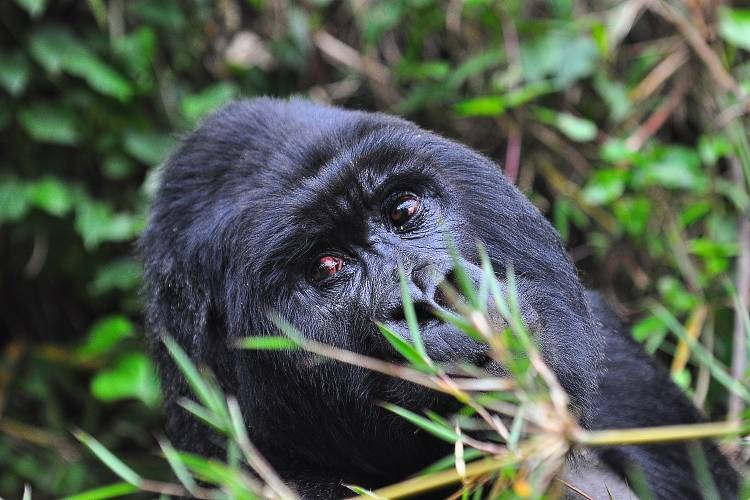 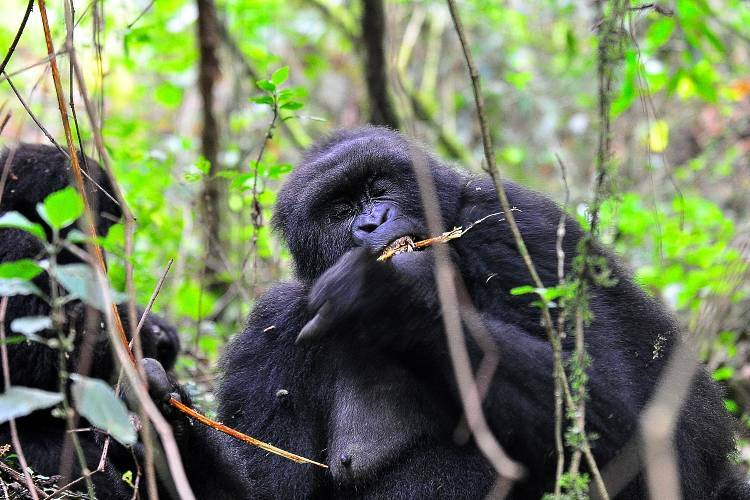 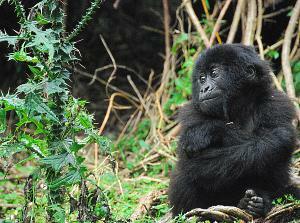 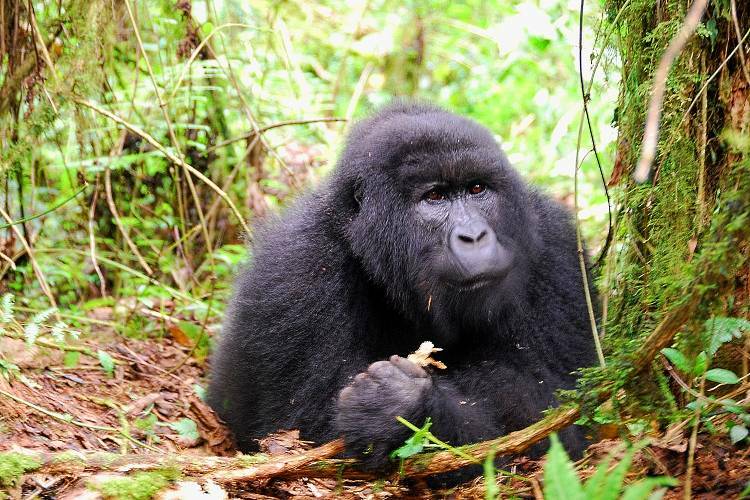 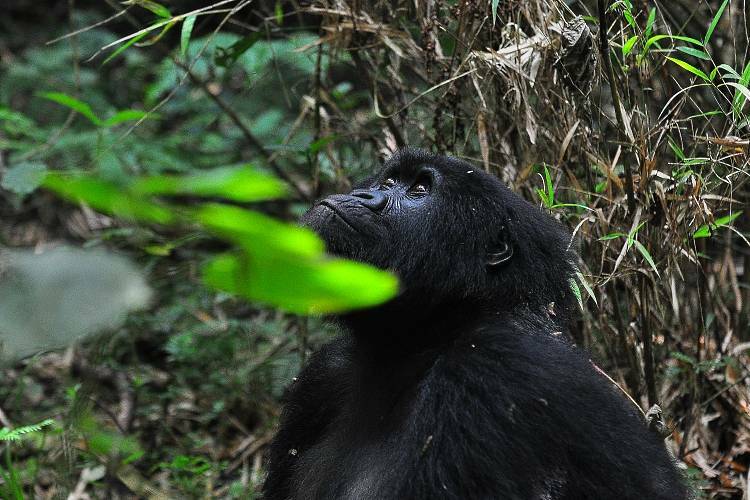 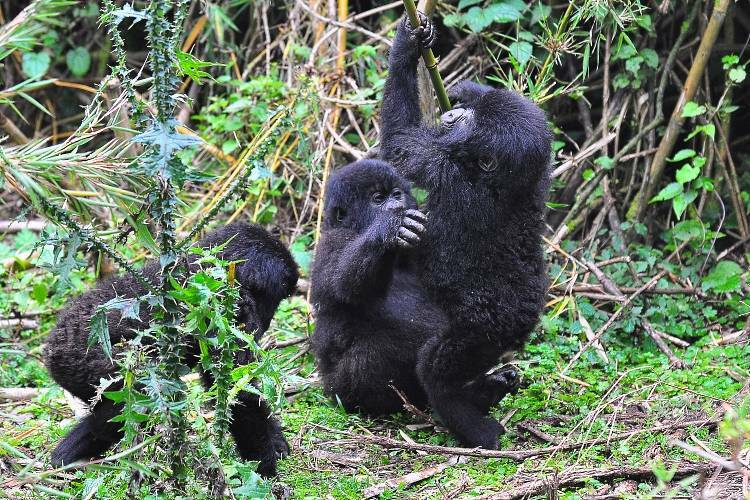 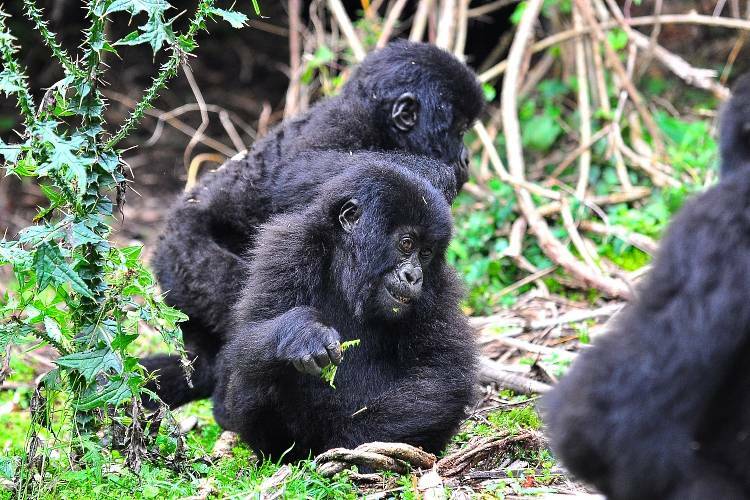 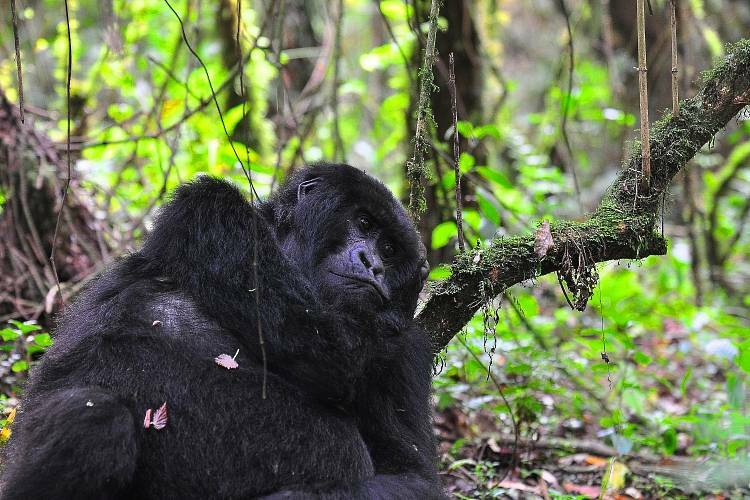 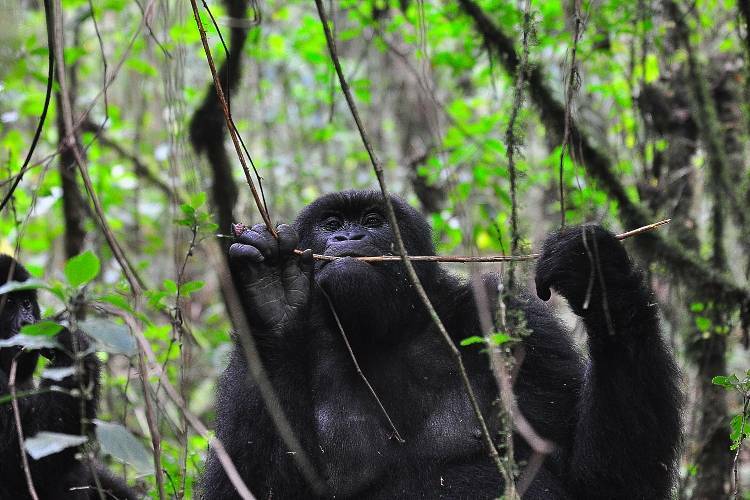 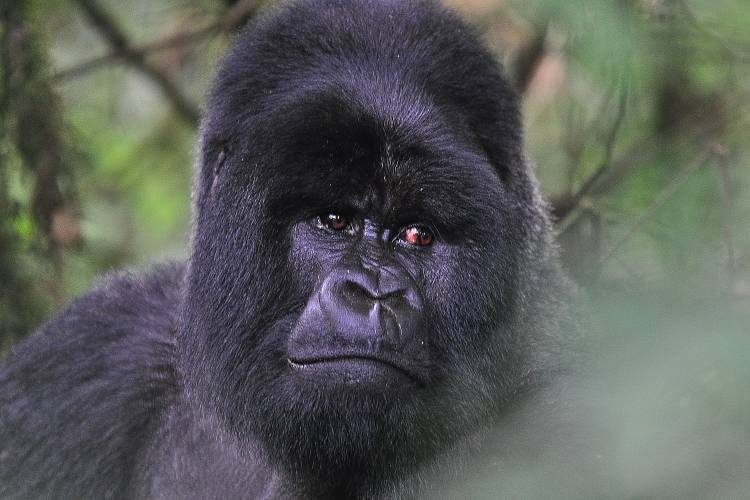 Heartbroken but undeterred, Fossey had Digit's remains carried back to her cabin and buried. 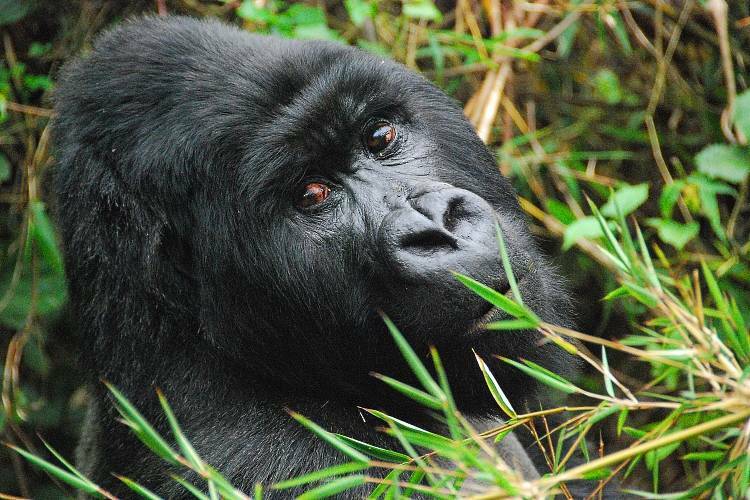 She publicized his gruesome death and established the Digit Fund (now the Dian Fossey Gorilla Fund International, see gorillafund.org) to raise money for anti-poaching patrols and conservation. 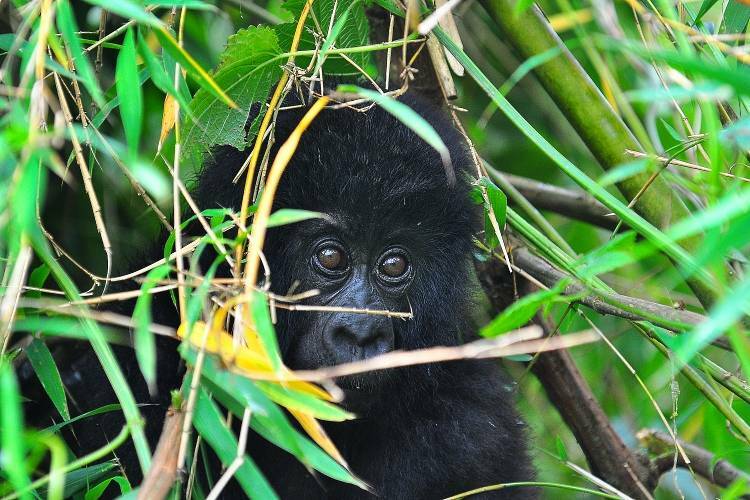 Through a wall of bamboo, something large and dark was moving parallel to our group, but in the dim and dappled light, I could not make out what it was. 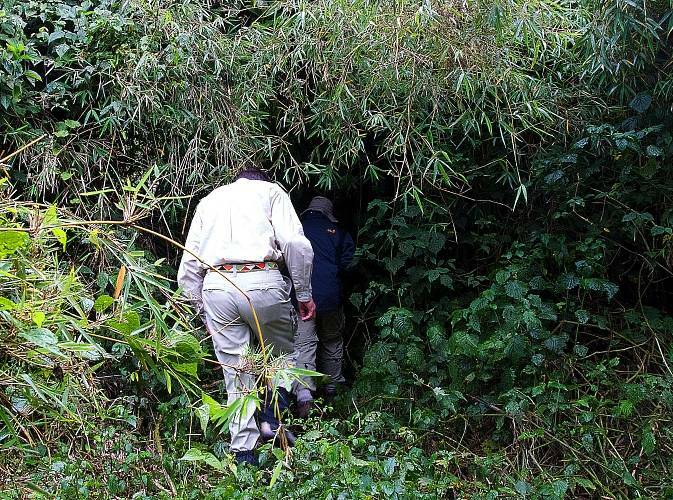 The tracker in front of me whacked vines and bamboo with his panga (machete) and the rest of us ducked and wiggled through the narrow opening he was creating in the nearly impenetrable forest. 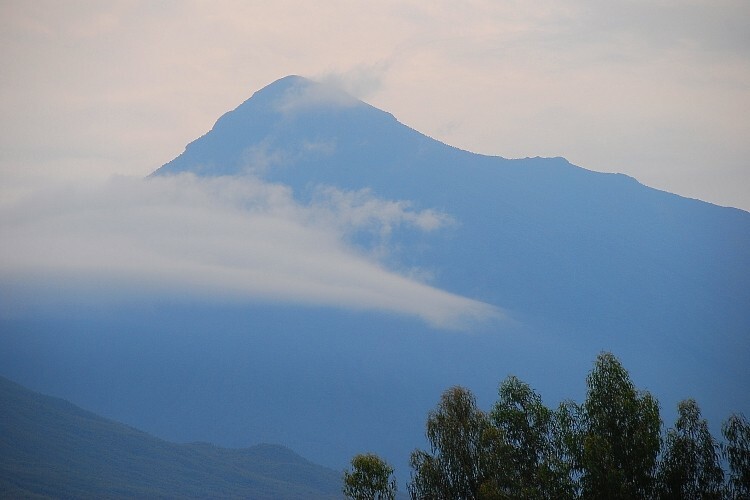 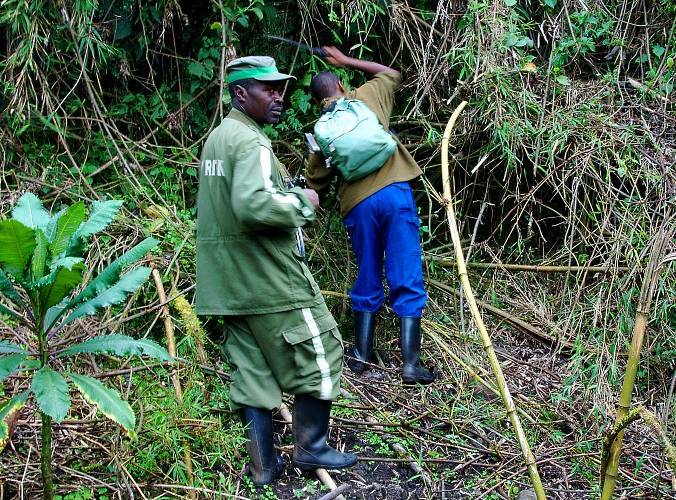 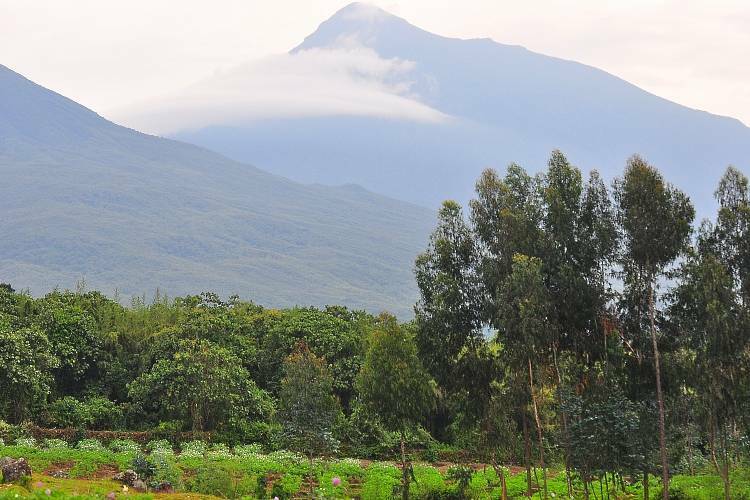 We were trekking at 10,000 feet elevation on the Rwandan side of the Virunga Conservation Area, a mountainous jungle dominated by eight volcanoes and shared by DR Congo. 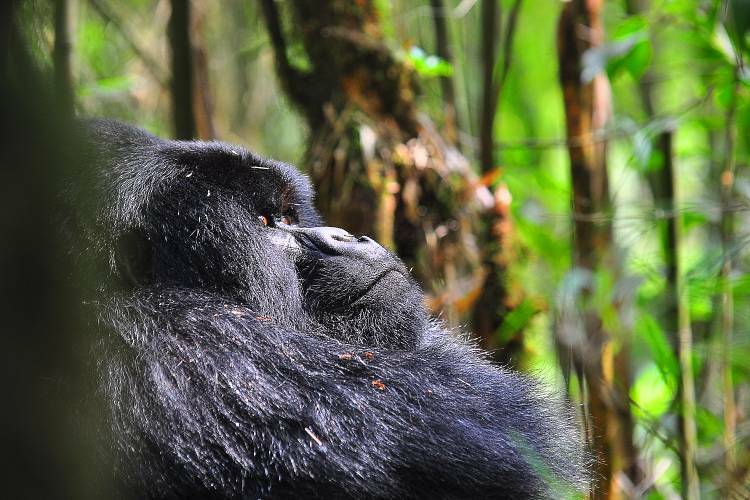 Ahead and above us, another dark mass appeared on top of the leafy canopy and the bamboo shuddered and creaked under its weight. 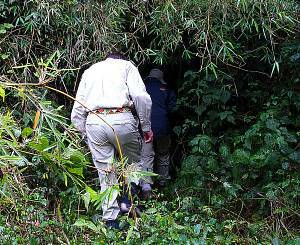 Suddenly, amorphous black creatures seemed to be moving through the foliage all around us. 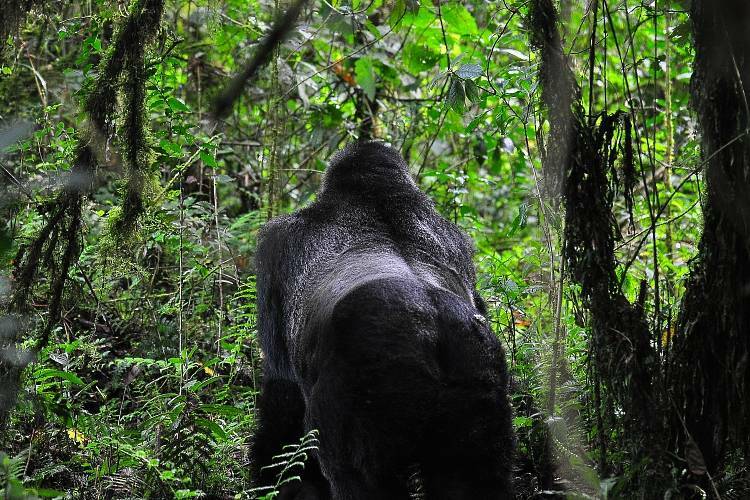 Our tracker uttered a low, grunting sound to reassure whatever was out there that we were not a threat. 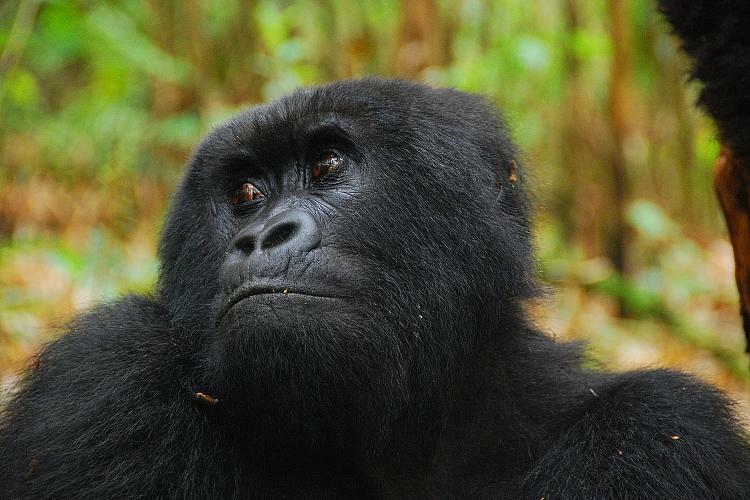 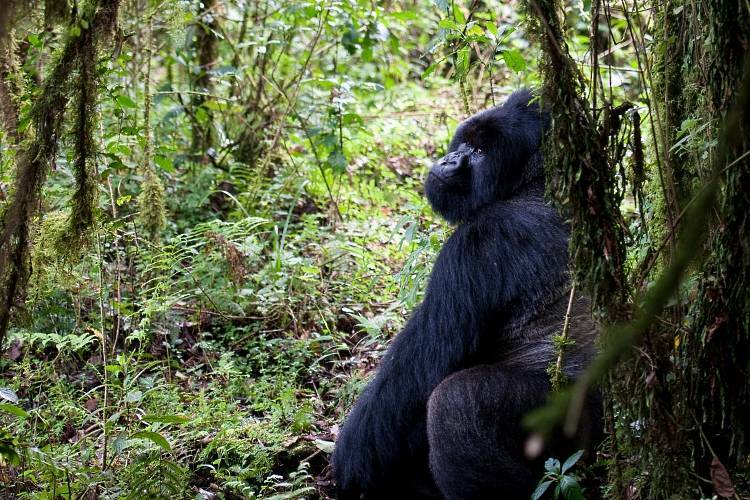 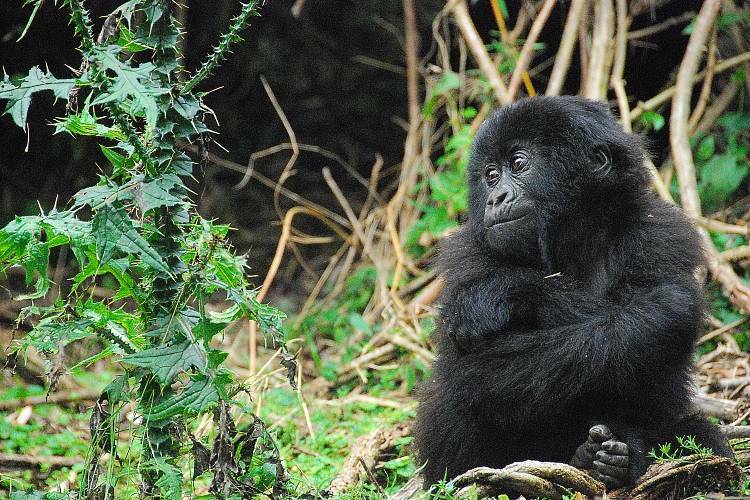 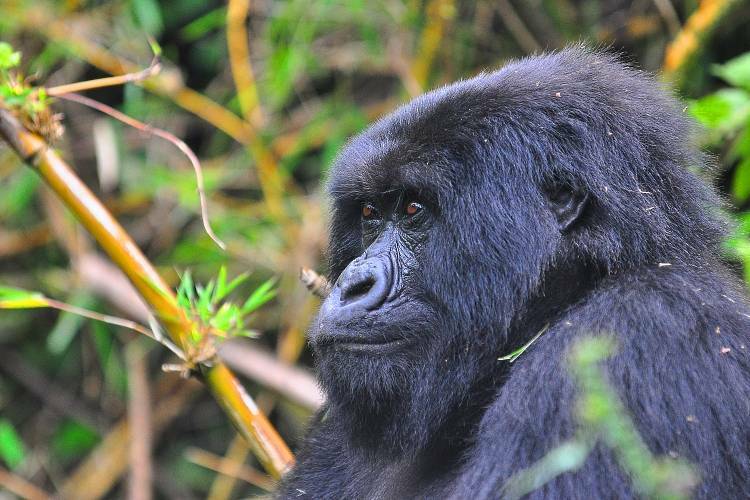 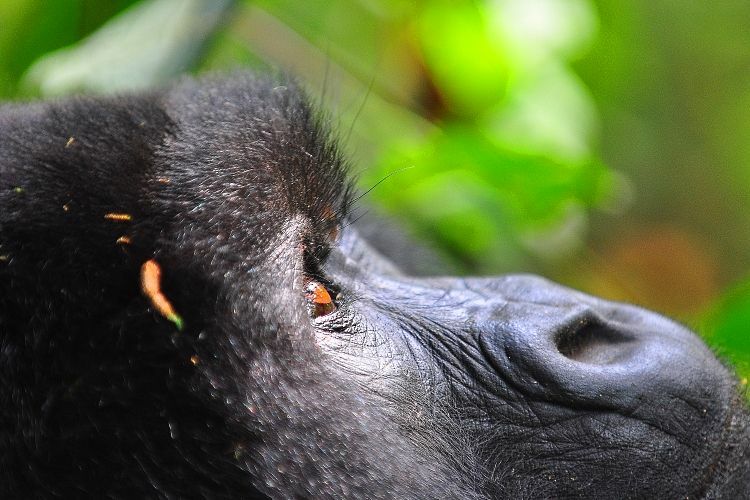 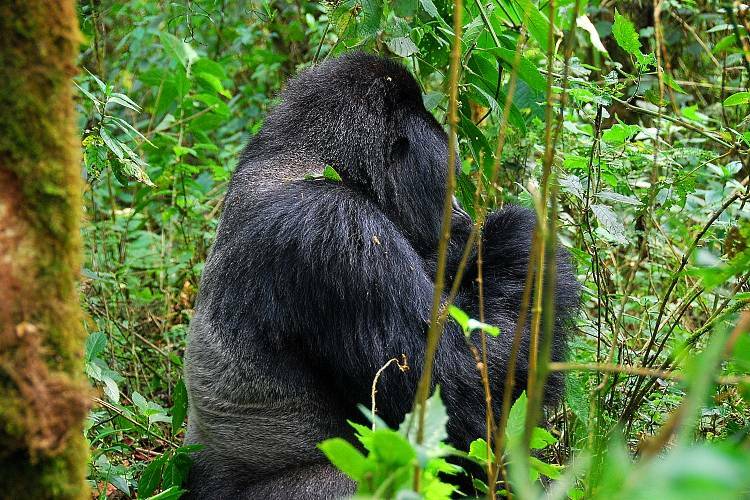 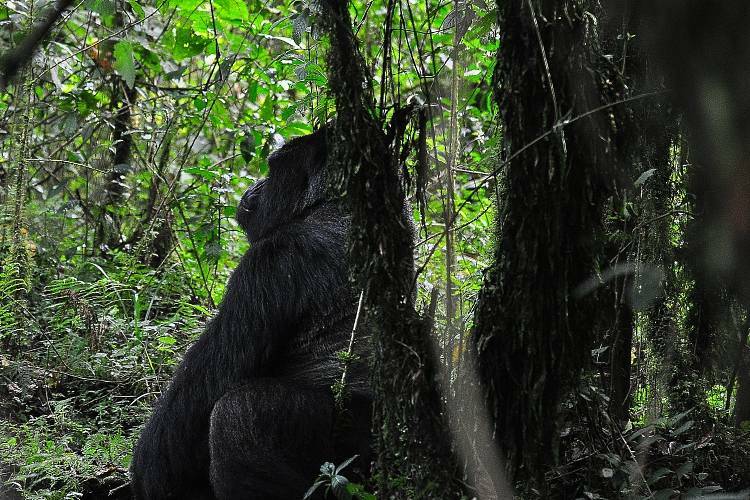 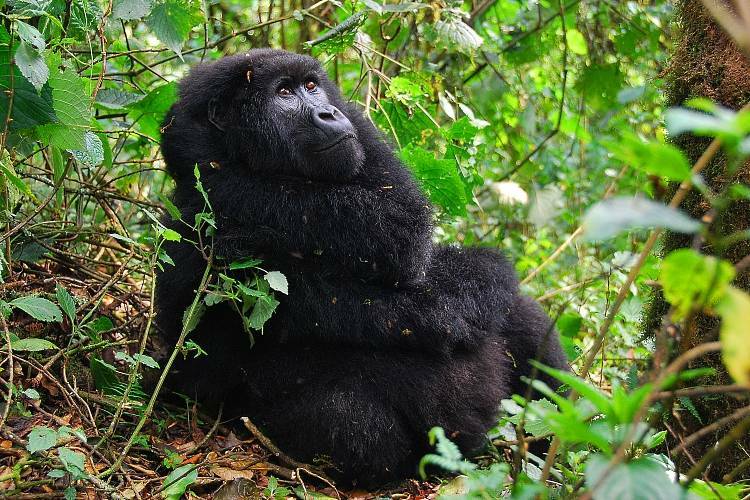 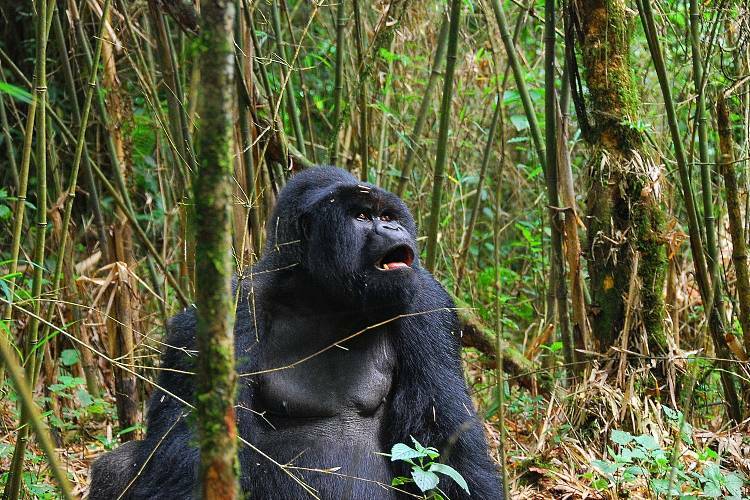 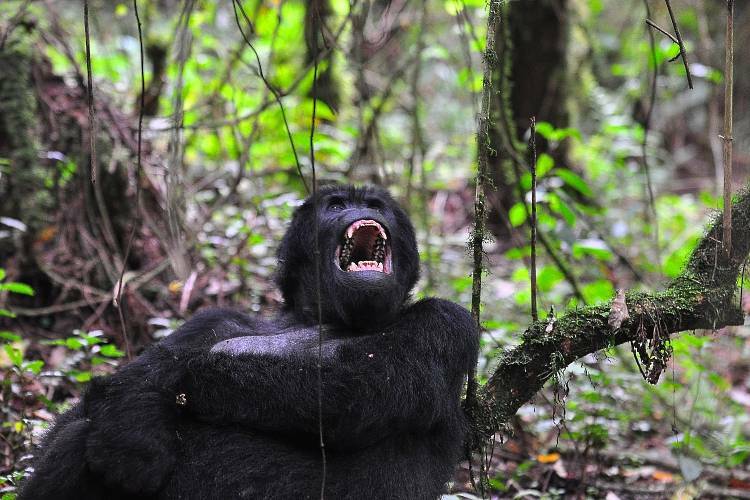 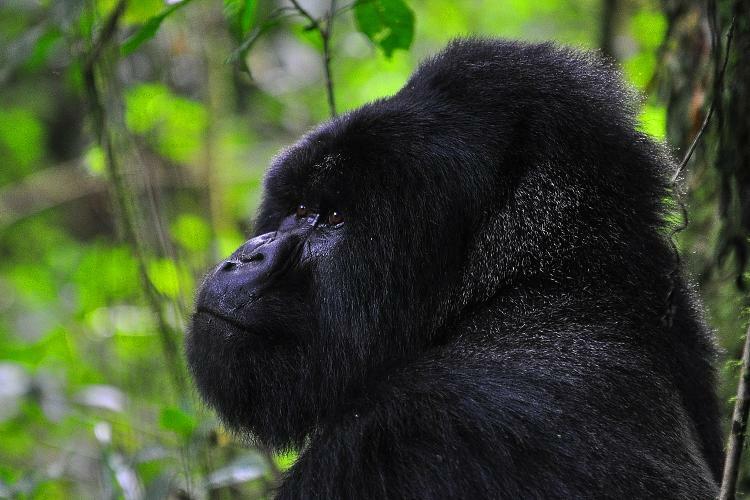 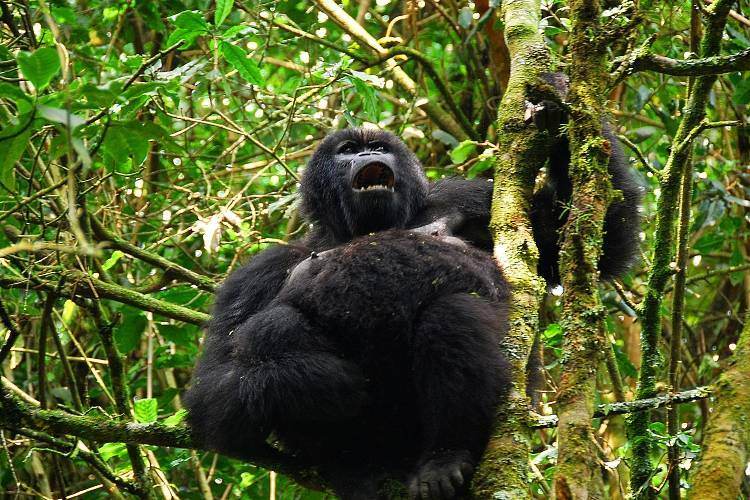 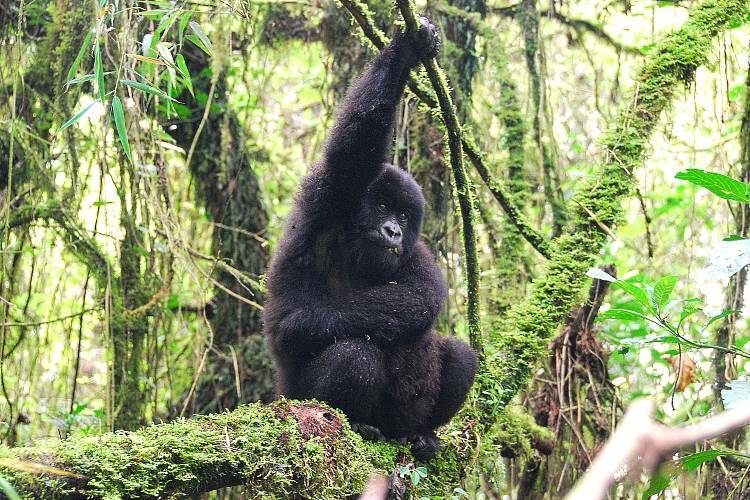 Silverbacks are adult males more than 12 years of age with a wide band of silver hair across their backs. They are the largest primates on the planet, and may grow to 6 feet in height and weigh more than 500 pounds. 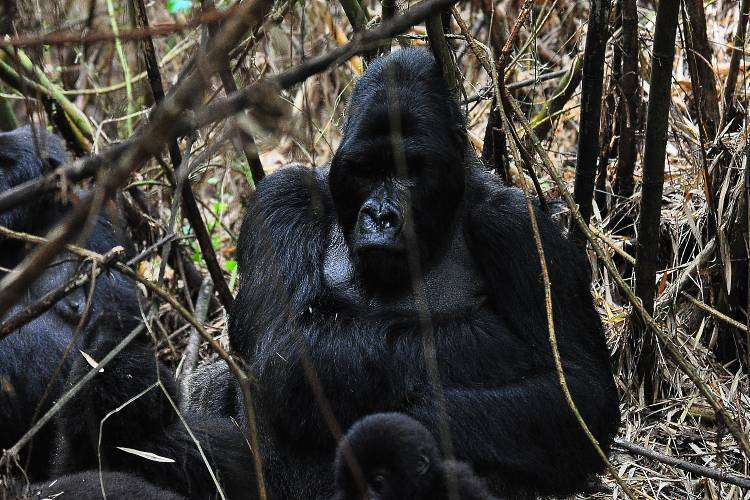 Every gorilla family is headed by a silverback and some families have more than one. 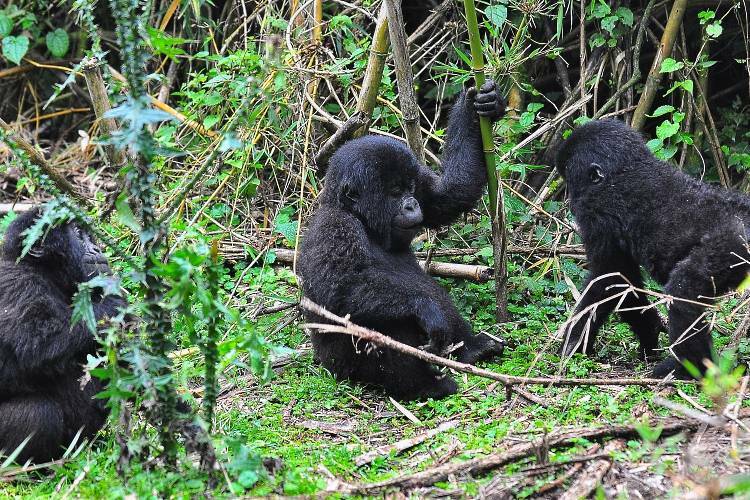 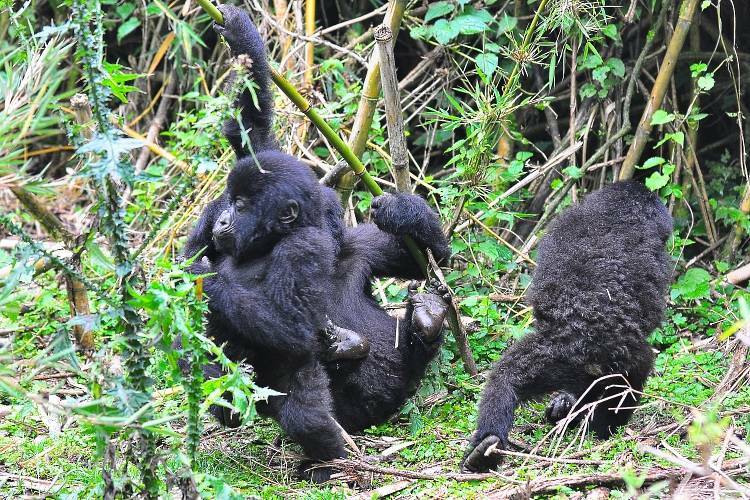 For 60 minutes (the maximum visitation allowed per gorilla family, per day), our group of eight tourists and two trackers watched the gorillas eat, play, communicate, climb and politely go about their business, always on the move. 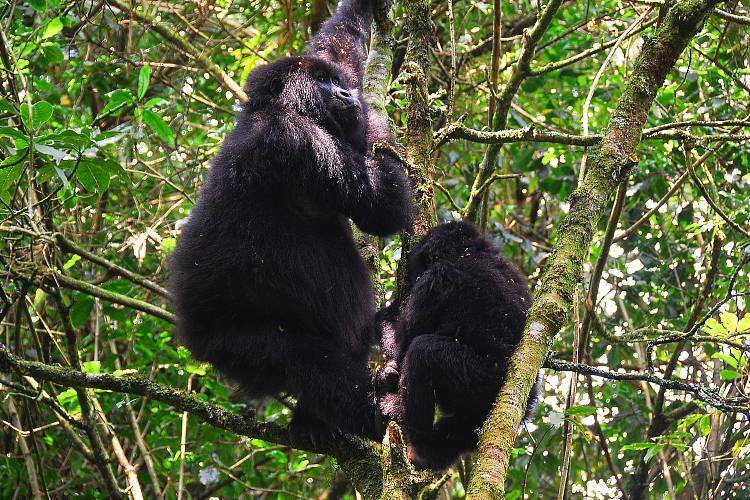 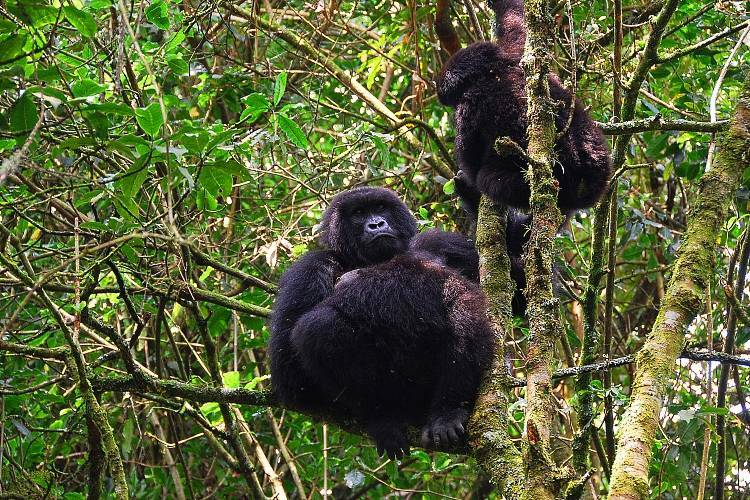 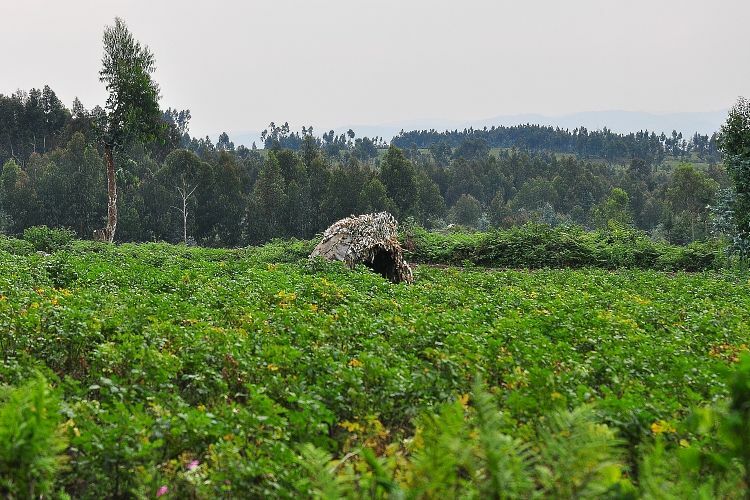 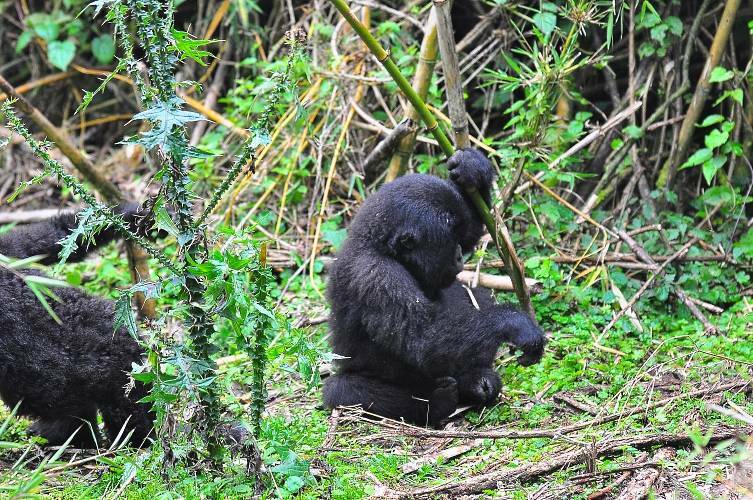 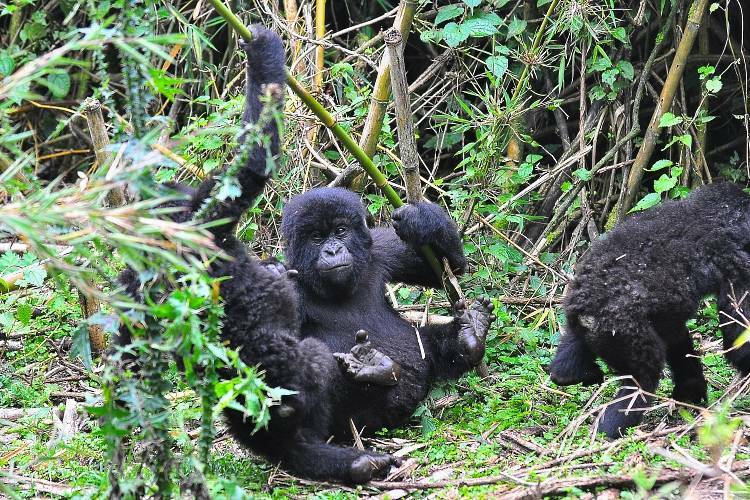 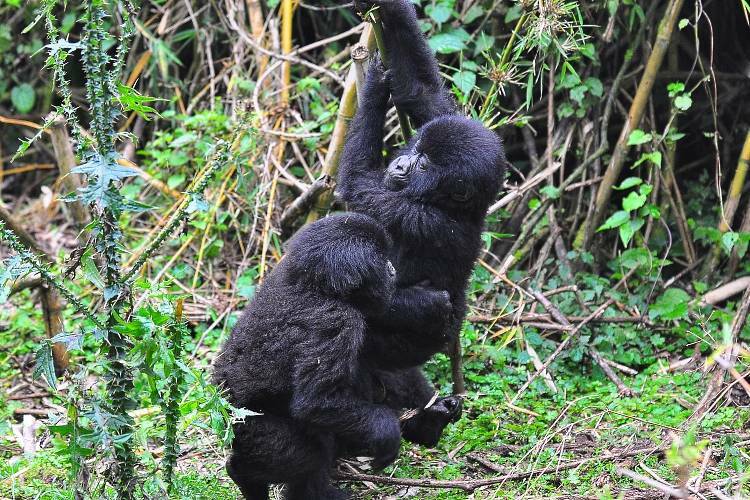 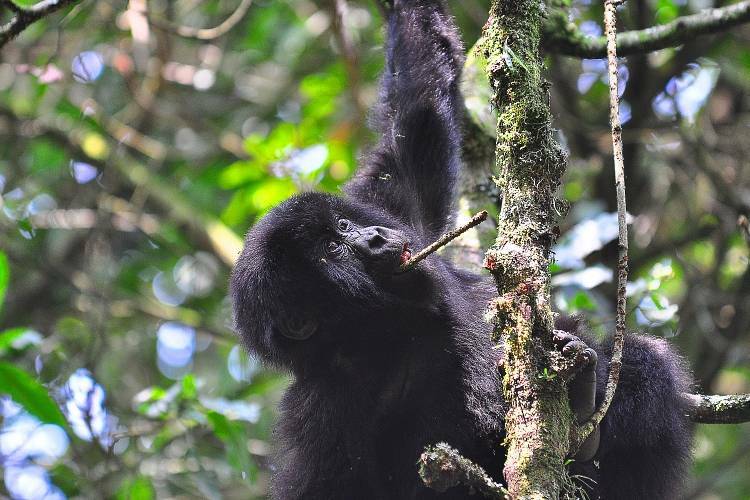 We were keenly aware of their intelligence and I felt a bit like we were intruding on their solitude, but a steady flow of tourists is an essential part of the formula that keeps gorillas alive. 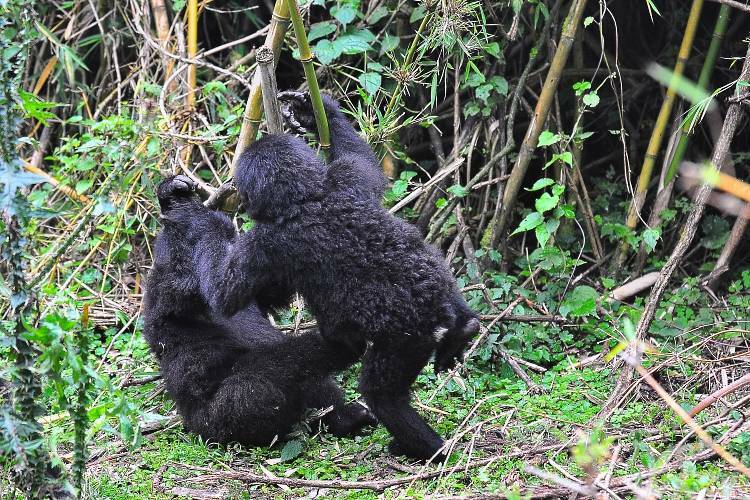 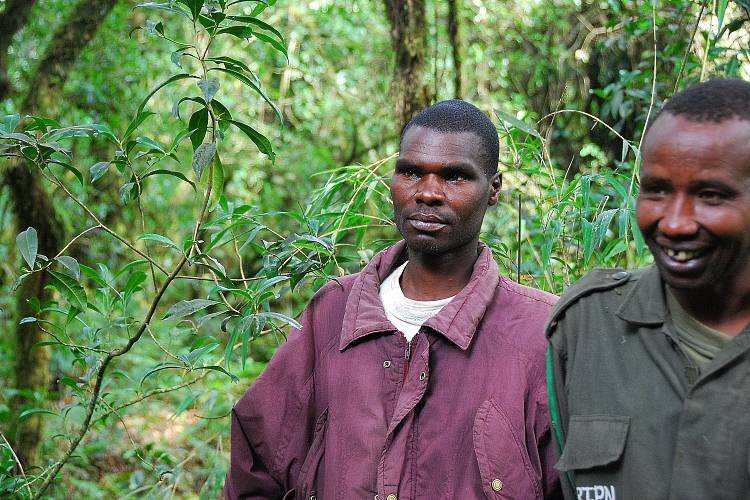 The park fee of $500 per person, per day, to track the gorillas pays for the game wardens who protect the animals and their habitat. 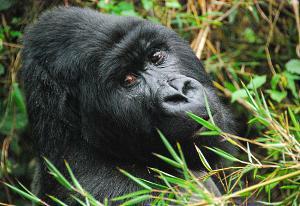 More than 90% of gorilla DNA is identical to human DNA, and they are susceptible to human diseases. 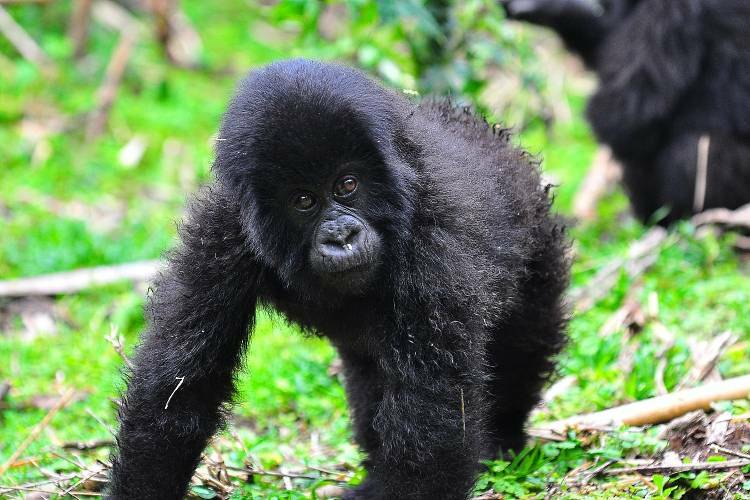 We were required to stay at least 22 feet away so we would not transfer any germs. 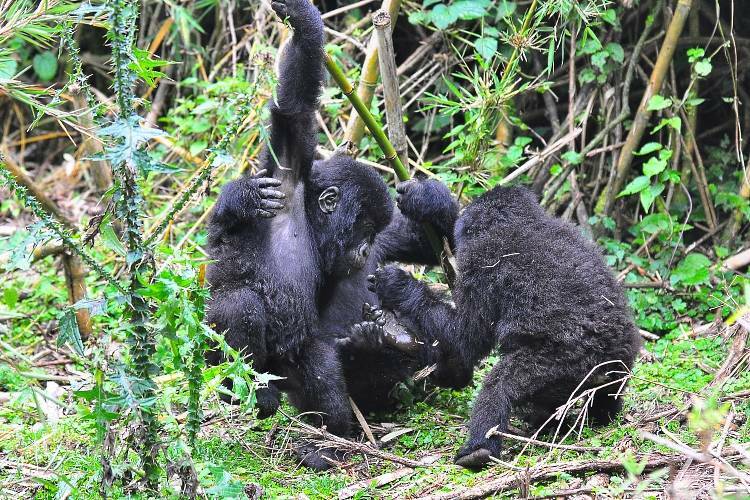 This was easier said than done as the gorillas had not read the rules. 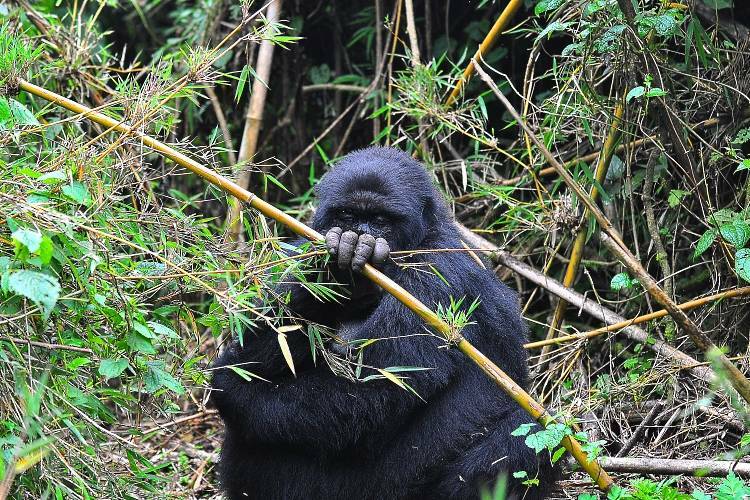 They frequently walked up to us from behind or squeezed by us on narrow trails where all we could do was lean back on the bamboo curtain. 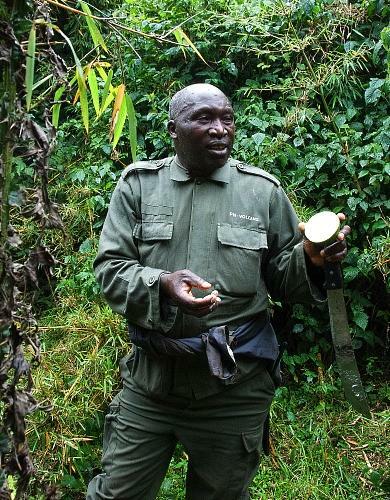 "The man who kills the animals today is the man who kills the people who get in his way tomorrow." 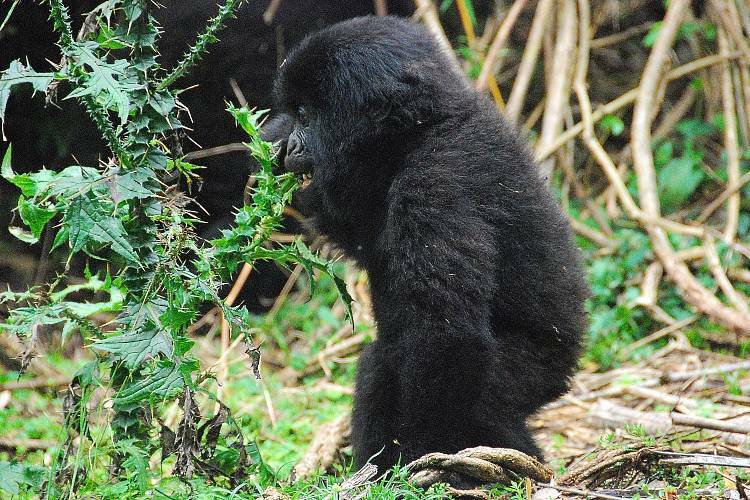 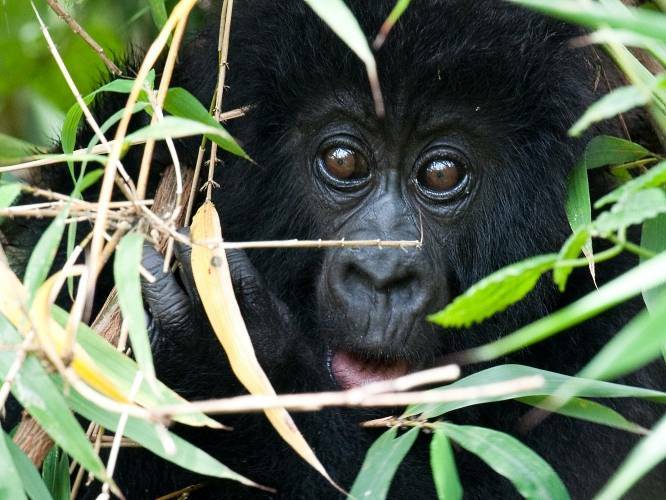 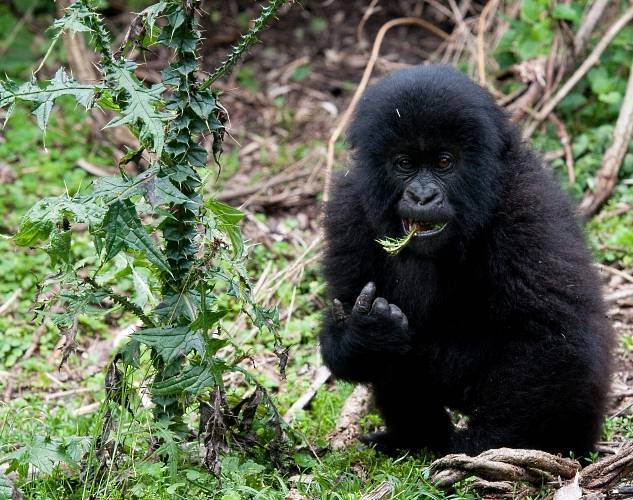 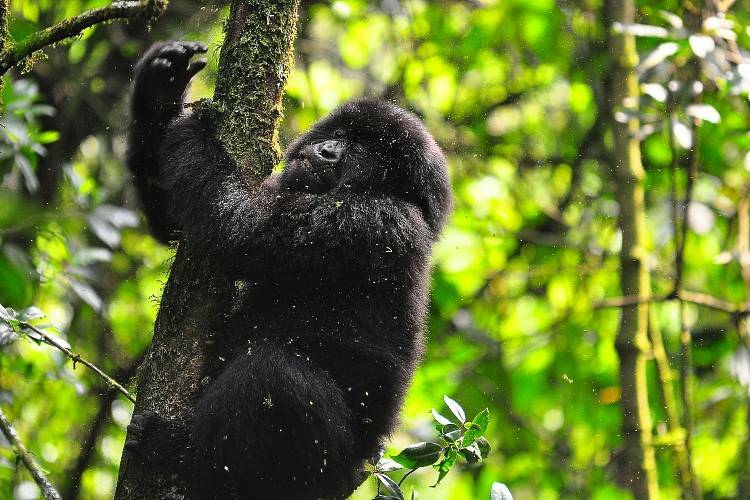 To find out what the Dian Fossey Gorilla Fund International and Karisoke Research Center are doing to save mountain gorillas -- and how other humans can help -- please visit GorillaFund.org.